Yes, that is a whale!!! There are so many Americans and Canadians who live in Baja California on either a part-time or full-time basis, it seems there’s more written and filmed about that Mexican peninsula in English these days than in Spanish. In addition to those Baja homeowners, increasingly more and more people visit the Mexican peninsula each year. They have a lot more information at their disposal these days than in past generations when former experience was the best guide. Baja is even finding its way into the mainstream media. A new movie just released about the Baja 1000 off-road race is the latest exposure in a widening Baja media that includes movies, radio shows, books, magazines, newspapers, websites, discussion boards and travel clubs, aimed exclusively to an English speaking audience. Independent Artists just released documentary filmmaker Dana Brown’s Dust to Glory, a thriller following several off-road riders for 1,000 punishing miles in the Tecate SCORE Baja 1,000. Brown’s father Bruce Brown produced the legendary racing film On Any Sunday as well as the surfing classic The Endless Summer. 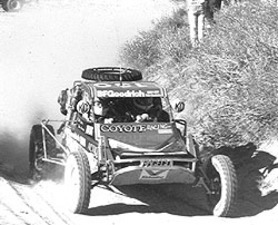 Among the celebrities and famous Baja off-road participants who play themselves in Dust to Glory are: Mario Andretti (Grand Marshall), Robby Gordon, Jimmy Vasser, Ricky Johnson, Larry Roeseler, Malcolm Smith, Ivan Stewart, Parnelli Jones, and San Clemente’s own winner of numerous Baja 1,000 races, motorcyclist Johnny Campbell. Steve McQueen and James Garner are also featured in some of the old footage. Specially mounted cameras render a thrilling personal perspective as the participants try to finish the 1,000 miles in record time. The movie is being released in selected cities around the country. A totally different Baja movie is the I-MAX big screen Ocean Oasis, an outstanding, beautifully produced film developed to educate viewers in conservation and the environment. It is a stunning visual portrayal of the fragile ecosystems and biological diversity of Baja California and the Sea of Cortez. Nature’s wealth is displayed by bird-covered islands, hidden coves, and abundant sealift. Produced by a consortium of interests, including the San Diego Natural History Museum, and Mexican environmental organizations, the engaging and remarkable film has been viewed in theaters worldwide and has already reaped benefits in Mexican education and worldwide conservation efforts. Of course, the Fox Baja studio south of Rosarito Beach has made Baja a virtual Mexican Hollywood. From the studio’s first blockbuster film Titanic to the later Pearl Harbor and Master and Commander, numerous major motion pictures have been filmed in Baja. For more on the studio, www.foxbaja.com. Foxploration tours next door to the studio are also available Wednesday through Sunday. On TV, a recent episode of The Bachelor was filmed in Loreto, Baja California Sur. Even radio shows have sprung up. A very fine one, Baja Talk Radio, featuring host Ted Donovan, airs every Tuesday, but all shows are archived and many Baja Buffs just pull it up and listen at their convenience. The show features Baja expert guests who are interviewed and then answer questions either e-mailed or called in. I was even a guest a few months ago talking about my books Baja Legends and Baja Fever. Access at: www.worldtalkradio.com/show.asp?sid=126. Similar to a radio show is an Internet magazine and there are several of those. One interesting one is www.trybaja.com. And of course, there are books that range from historical treatises to pulp novels. I personally have over 250 Baja-related books in my collection. Depending on one’s interests, there are many specific books I could recommend. There are Baja books on kayaking, boating, flying, fishing, hunting, climbing, cave paintings, whale watching, missions, racing, bicycling, exploring, geology, just plain living in Baja, and more. Perhaps the best basic guidebooks are Joe Cummings’ Baja Handbook (Moon Travel), or the Automobile Club book Baja California (AAA). Other great guides are Baja Adventure Book by Walt Peterson or The Magnificent Peninsula by Jack Williams. With so many gringos there, it’s no surprise that more novels are Baja based. Several new ones, like Murder in La Paz by Murdoch Hughes and Elizabeth Maul Swartz’ Troubled Sea have joined the ranks of the very fine King of the Moon written by Gene Kira several years ago. There are numerous magazines and newspapers written in English for the Baja traveler or resident. Two of the finest magazines are both now yearly publications and can also be accessed on-line. Eric Cutter’s beautiful Baja Life www.bajalife.com is the oldest, and is a comprehensive web site, allowing you to buy past copies on-line. Mayte Rodriquez-Cedillo does a great job with her Baja Traveler www.bajamagazine.com and you can buy it all over Baja and Southern California. Most newspapers are semi-monthly or monthly and can be picked up at hotels or restaurants. The Baja Times is the oldest, published from 1978 to 1995. It stopped publication for a while, was resurrected as Baja Tourist Guide, and re-morphed back into the Baja Times last year. Published in Rosarito Beach twice a month, some 20,000+ copies are distributed from San Diego to Ensenada. For more info, contact Laura Wong through their website www.bajatimes.com. Serving the same area as the Baja Times, is the Gringo Gazette North (There is also a Gringo Gazette South based in Cabo San Lucas). Also published every two weeks, some 15,000 copies make their way along the Gold Coast of Baja (Playas de Tijuana to Ensenada). Edited by Nancy Conroy, the Gringo Gazette is also on-line at www.gringogazettenorth.com. The Ensenada Gazette is a monthly newspaper published in Ensenada by Connie Ellig and David Hopp. It provides outstanding coverage of news and the numerous events in the Ensenada area. Can also be read on-line: www.ensenadagazette.com. There are regional newspapers for Americans and Canadians in all of the major locations they have settled, including San Felipe, East Cape, Los Cabos, and Todos Santos. The Baja 1,000. There are more web sites dedicated to Baja California than there were tourists when I first started going there. Some of the more popular ones are: Carlos Fiesta’s fine www.bajaexpo.com, or www.bajanomad.com, operated by Doug Means. Other good web sites are www.bajaquest.com, or www.baja-web.com, or www.baja4fun.com. Also www.bajainsider.com is quite newsy, and Gene Kira’s www.bajadestinations.com is very easy to navigate and provides links to fishing, tours, adventures, weather, and tides. A very comprehensive and literate web site is Fred Metcalf’s fine http://math.ucr.edu/ftm site. It also has one of the most popular boards for discussions on Baja. Another well-used board is Doug Means’ www.bajanomad.com. The boards are often used for novices to ask questions (like about drinking the water and avoiding bandidos) and the experts answer.